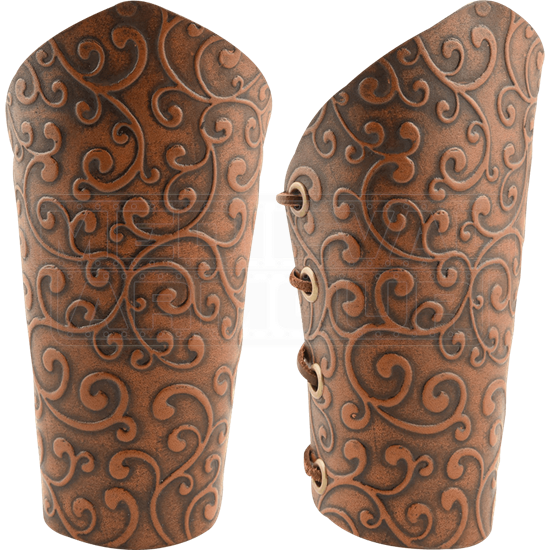 Embody the elegant side of medieval fantasy when you wear the Elven Swirl Arm Bracers. With a beautiful, swirling vine pattern embossed throughout, these handcrafted leather bracers comes in your choice of black or antiqued brown. Coming to a gentle point at the edge of the forearm, these medieval leather bracers are secured at the back with included leather cord lacing. The black leather option has steel grommets, while the antiqued brown leather option has antique brass grommets. Sold as a set of two, these medieval ladies bracers are perfect for adding graceful charm to warrior, adventurer, and noblewoman outfits alike.